Hmm... according to the code, the fallback if there are no spaces in sight is to simply not spawn at all. So I have to assume there was a spot she could see at first... but it's possible she wasn't able to get close enough to actually fire due to all the hounds and you. In such an event, she may have given up and wandered off from the encounter. Definitely some off about Regen eval btw, looking at it now. Found it! A simple typo... but a nasty one. Of course, the proper way to average two values is to ADD them together, then divide by 2. I was um.. MULTIPLYING them together and dividing by 2. Making Possess a charge cooldown would basically force players to choose between it and Mobility on Shikome. Could you consider giving them swiftness instead? Though notably, Chindi just got a bit more deadly, in an opposite sense. I'm not sure if this is worth noting, but it seems like the Brand tootips display on the left side of the screen to early. I'm guessing that it's supposed to show up on the left if the cursor would overlap with the tooltip box, but it starts doing that a few tiles too early. I'l keep updating my thread also, but I didn't get used to using brands yet. Also, I encountered some insane Racho groups. It's notable that one of them was insane because of a very good brand. (No abilities with SP cost ocer 5, +13 agility and magic) There's a chance that there will have to be something in place that would prevent such craziness. It's worth noting for sure. 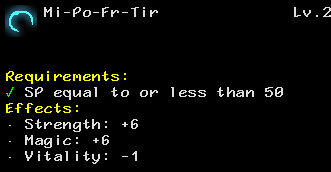 Left-hand tooltips're very new, bound to be some weirdness there. I may have to nerf low level enemy demon Brands... and probably will for sure on Tower:1 at least, but even by Tower:2 (when Raicho can first appear), I start to feel okay with the gloves being off, at least a little. No need for a file on that one since it's pretty clear what's going on. I think I've played enough with this update to gather some thoughts about it. Brands are definitely a nice addition to the game, as they add a new dimension for character building. However, some balancing is still required. -SP cost (both flat and %based, although %based is slightly better) and +SP per turn boons are really weak on their own. -2SP cost is hardly ever going to matter much, same with -10-15%SP cost. It's nice to get something like -20%costs -5cunning on an early healer, but when you find -14% or -2SP cost as your lvl 15 brand it's just sad. Same with +1.5SP per turn. Especially considering that +SP costs as penalty are waaay higher. Had a giggle when I fought Mandrake+Dryad pack with +20cunning +10 ability costs. And yes, they were using meditate for 10SP to restore 10SP. Also +SP costs seem to affect auras: characters with such brands and aura abilities bleed SP every turn. I'd also check reactive abilities. +SP costs and +SP per turn shouldn't exist, at least with current numbers (+5SP costs +1.5SP per turn, will it ever going to pay off?). That concludes my rant about SP related brands. I hope hero solution is temporal one. Obviously, special hero brands are far more exciting than just +10%lvl increase for heroes. Didn't feel like it changed much either (which is probably a good thing, because otherwise hero fights would've been easier with all those brands I was packing). One thing I noticed though, in my 2 runs Adria never spawned in Baphomet's sanctum where she usually hangs out, instead she spawned on T16, I wonder if it's because she is too grown up for that sanctum now. I think that relic upgrade that would allow to level up your brands is almost necessary. Even with current "starting" brand modifiers pack really fun brands are rare. I only had 2 truly memorable ones: HP = MaxHp, no active abilities, +104 Strength, and it was only like lvl 10 or so, could be really fun for specific innocence punch build, another one was Max SP cost is 0, +62 Vit, +62 Mag, -some cunning, Perfect for veil tanking. These are build defying brands and without them your niche build just won't work, so if you are going to fully switch to something like this on T10, it the late game you will start to feel the fall off pretty badly. And not only that, even among regular 1-2 effect brands I wasn't finding anything even slightly interesting half of the time, my lvl20 demons often had lvl5-10 brands equipped. My mirror chime had some random brands on demons for some reason, although summoner himself had the right one. And brands that they had weren't bound to the floor they got spawned on. Probably forgetting something else, but that's everything for now.